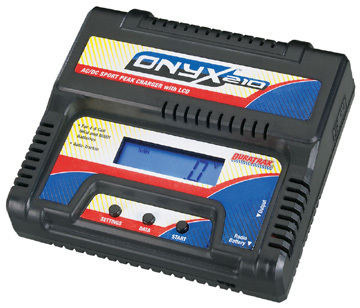 Duratrax Onyx 210 AC/DC Peak Battery Charger Discounts Apply ! DTX210 - Duratrax Onyx 210 AC/DC peak battery charger with LCD and Tamiya connector. Charges anywhere from 4 to 8 NiCd and NiMH batteries, with output current selections of 800mA, 1.5A, 3A, and 5 amps. Great for charging batteries for 1/16th RC tanks, receiver packs, and even transmitter batteries! A tiny, lightweight built-in switching AC power supply plus DC input capability is perfect for use at home or the battlefield. A custom LCD with backlight is great for use indoors or outdoors, daytime or night. The Onyx 210 has more applications (and convenience) than nearly any charger in its price range! Five year warranty (U.S.A. and Canada only). Discontinued item. A super-small, lightweight built-in AC power supply is great for cramped pit spaces, and easy portability. Selectable charge currents of 800mA, 1.5A, 3A, and 5 amps, with an auto-trickle function. A custom peak detection system loads NiCd and NiMH batteries full of power. Pushbutton controls and audible tones make for easy setup and control. Large alligator clips on the DC input easily connect to most 12V DC power sources. A backup safety timer automatically stops charge to prevent accidental battery overcharge. Includes a built-in output lead with standard Tamiya plug. Solid-state reverse polarity and current overload safety devices ensure trouble-free operation and long duration. Connect 4, 5, even 8 cell NiCd or NiMH radio batteries with universal jack connector located in front of charger.